Reading, Phonics, Comprehension, Word Work and More! 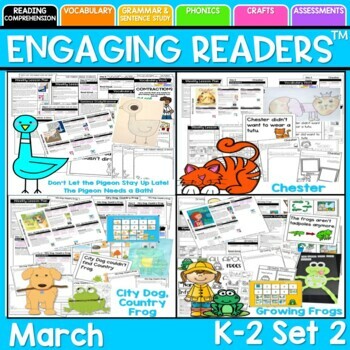 Set one of these reading units were a best seller! Due to popular request from several school districts we have created a second edition so that Kindergarten and First-grade teachers in the same school can use them without duplicating the stories. NOTE: This isn't a packet of worksheets. These are actual Lessons that guide you through the process of using Read Alouds to teach the standards for Reading and Phonics. ☀This product also includes a free 1 hour pre-recorded webinar that will provide tips and insights on how to effectively implement these units in your classroom. This resource will save you hours of work because EVERYTHING is all planned out in easy to follow lesson plans and the materials are included for you! Just PRINT and TEACH! View the preview file to see more of what's included.